Goodbye, Venus Express. You were a lovely satellite, and lasted far longer than we had any right to expect. With propellant totally exhausted and on a decaying orbit, the spacecraft is presumed dead, burnt, crushed, and mangled by the hostile environment of Venus. Eight years into its mission with propellent finally running low, the satellite has been making more and more daring manoeuvres in a last burst of science before being destroyed by its unrelentingly hostile atmosphere. After climbing into a high orbit to give it the longest drift-time down to the planet, the satellite was supposed to burn off the last of its fuel between November 23rd and 30th. This final burn was to give the Venus Express a last little lift to correct orbital decay from atmospheric drag and keep it flying until 2015, but it looks like it ran out of umph partway through the manoeuvre on November 28th. Mission controllers suspect this left the satellite in a spin, unable to contact the Earth unless its antennas whirled around to just the right position. Weeks later, the Venus Express is finally presumed dead. Goodnight, Venus Express. Built in just 33 months and intended to only run for 2 years, you've gone way above and beyond the call of duty, even for a robotic explorer. 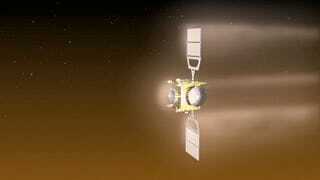 With the loss of Venus Express, we currently have no robotic explorers around the planet. The next spacecraft due to arrive is Akatsuki, a Japanese satellite. After missing the chance to inject itself into orbit around Venus in 2010, the satellite is preparing for its next window of opportunity in 2015.